MooCowMusic Support Forum • We are in the dictionary! We are in the dictionary! The "Grove Dictionary of Musical Instruments” is the largest, most comprehensive reference publication on musical instruments, and forms part of the "Grove Dictionary of Music and Musicians”, first published in 1879 and considered the primary academic reference. 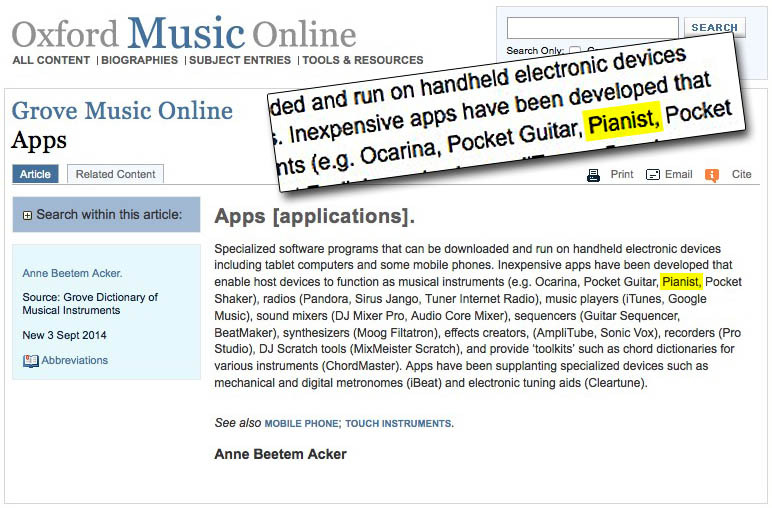 The soon to be released Second Edition has an entry on “Apps” and lists Pianist as one of three examples of “apps that have been developed that enable host devices to function as musical instruments”. It is an amazing achievement for mobile music apps, once considered merely toys, to be officially recognized as real musical instruments. When we released Pianist in 2008 as one of the very first mobile musical instruments, we would never have imagined the global acceptance that music apps currently receive. Re: We are in the dictionary! The recent update to the Dictionary contains new definitions for Mobile Phone and Touch Instruments.